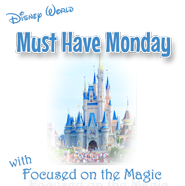 This week's magical merchandise is all about power…on the go! 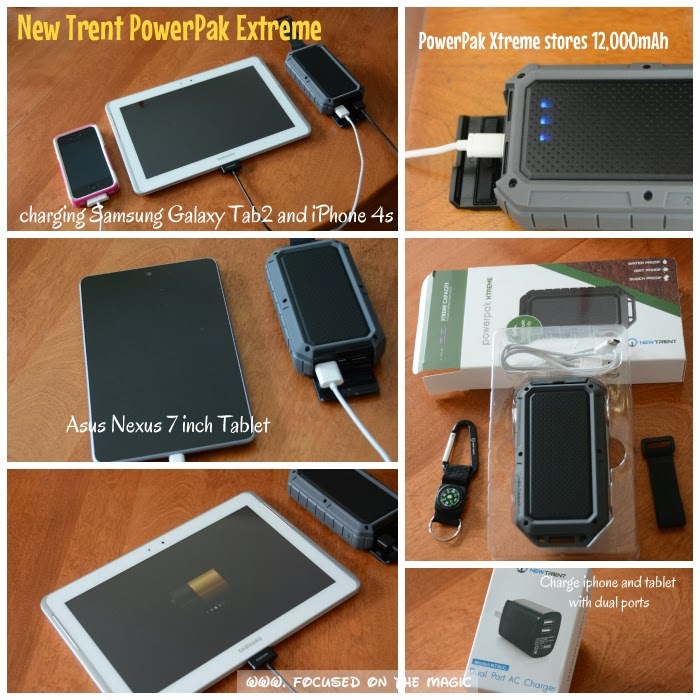 Today I am happy to review the New Trent PowerPak Xtreme - (12000mAh) Rugged Series NT120R and the New Trent IMP90C, dual usb wall charger. The latest additions to my travel gear bag. Need more power for the gadgets in your life? Over the past year or so I have on many occasions run out of battery life on my iPhone. During hurricane Sandy, traveling, camping, conferences and while touring the parks. In airports the charging stations always seem to be filled and the seats next to them are at a premium. Back in May at Walt Disney World on a photography blogging trip I found that my iPhone 4s battery was being depleted each day before I could get back to my resort to recharge it. I was using it ALOT testing new apps, taking pictures and texting. This is a common occurrence with everyone using their devices in the parks and Disney Park has addressed the issue offering courtesy charging stations for guests. As nice as that is, who wants to take time out of their touring plans to charge their phone? Not me, my time in the parks is precious and the last thing I want to do (ok, maybe not the last thing) is to go plug my phone in and then come back for it later. Maybe even worse than that is having to conserve your battery life by not taking pictures or not using apps so that you can make it through the day. When I got home from the last trip, I vowed that I was going to get myself a portable charger. Not just for emergencies, conferences and traveling but for everyday outings. I text, take pictures and videos often and my phone is always with me. Thankfully I won't be worrying about my low batteries anymore. The New Trent PowerPak Xtreme - (12000mAh) Rugged Series NT120R combined with the New Trent IMP90C, dual usb wall charger changed all that for me. I am now able to charge two devices at the same time in my resort with the IMP90C wall charger and on the go with the PowerPak Extreme! It is very easy to use! As soon as it arrived and after reading the directions which are clearly depicted on the box and manual I plugged the PowerPak Xtreme in to the IMP90C dual usb wall charger. Charging time is about 10 hours. The PowerPak Xtreme stores 12,000mAh, that's a lot of power for this compact ruggedly built device. Four blue lights will come on once it is fully charged. You simply plug your devices in, press the on button and you are charging. There are two outputs on the PowerPak Xtreme. One output is for Smartphones and one for Tablets. Both are clearly marked. I used both outputs at one point and it was fast. I used it to charge my iPhone 4s, Samsung Galaxy 2 Tablet and my sons Asus Nexus 7 inch Tablet. It's charging his MP3 player as I write. I charged my iPhone 4s FIVE times! All that on one charge of the PowerPak Xtreme NT120R and it still had plenty of power left in it. The only thing I thought might need improving was the on button. It's small and the same grey color as the exterior of the PowerPak Xtreme making it easy to overlook initially or in a dark setting. Maybe a little spot of color there would help. A small cosmetic fix and nothing to do with the superb performance of this device. The New Trent IMP90C, dual usb wall charger prongs fold up compactly for storing in my suitcase. Because it has dual ports for an iPhone and tablet, I only need one charger for traveling instead of two. I love how rugged the PowerPak Xtreme is and that it's water proof, dust proof and shock proof. Perfect for a trip to the beach or the mountains or rumbling around at the bottom of my bag every day. It is not a lightweight little thing. It weighs about as much as a 50mm Nikkor lens and is about the same size. It easily fits right in my camera bag. When we went to the beach I was able to leave it inside my bag while charging my iPhone. No more searching for charging stations or conserving battery power for me. The New Trent PowerPak Xtreme NT120R will be in my gear bag wherever I go! NewTrent.com is a Fremont, CA based designer and manufacturer of mobile accessories. They provide consumers with dependable, affordable battery power products for smartphones, tablets, music players and just about any gadget that needs recharging. You can purchase the New Trent PowerPak Xtreme - NT120R 12000mAh and the New Trent, 10W 5V/2A Dual Port high-speed USB AC wall charger (NT90C/IMP90C) Amazon( affiliate links) or Buy.com.